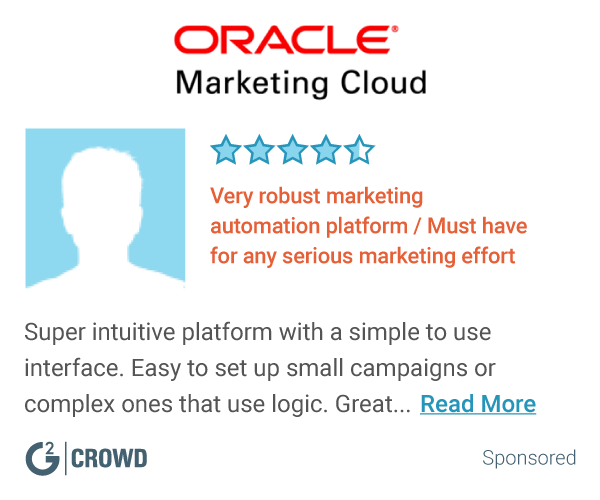 "The obvious choice for marketing automation"
A "secret sauce" for the marketer finally! Salesfusion makes me look like a rockstar! I love how the interface is geared toward a marketing brain. It was actually an easy choice to choose Salesfusion after many demos of other automation tools. Not only was our experience on point from the very first chat with SF, but they always take the time to answer every single question we may have and keep up that service level. I also appreciate them enhancing features constantly so I can do my job better. Training is a lot to take in. We were eager to get moving quickly, but I believe it went too fast. This may have been due to our deadline. Still today, they answer questions and record calls to go back to. Aligning marketing and sales is always something you are working on. Sales Fusion has helped button our buttons when it comes to automation. We are able to create successful campaigns and for our business, saw immediate results after implementation. We are tracking weekly dashboards and now have a clearer picture into our industry. "GOOD core marketing automation capabilities GREAT support"
Platform is relatively easy to use and navigate. It provides the core functionality for marketing automation and allowed us to expand beyond basic email marketing with lead scoring, event management, landing pages, etc. Also liked their business model a lot. Other vendors we evaluated were looking to charge per user (marketing and sales users) which would have limited our adoption and use of the product. Salesfusion unlimited user price model allowed us to get the functionality we needed and have the freedom to scale it throughout the company as we grew. New folks who come from using other solutions are always surprised that we can 'just add a user' when needed. During our initial evaluation, their native CRM integrations were a big plus as well. Other vendors were relying on 3rd party solutions or had limited access to the underlying CRM data. Connecting our marketing data to CRM was key for us to be effective and allows for easy targeting based on our full set of CRM data. CRM connection is clearly an area of investment for them as they continue to improve with dynamic lists and the upcoming campaign object support which will further allow us to leverage CRM data to drive our campaigns and effectively measure ROI. Finally, the item that has been the biggest positive for us is the support the Salesfusion team provides. The program is not without its issues and learning curve, but having the support team there to help makes us confident we can solve our problems quickly. Everyone I have interacted with in support has always been courteous and out to help us solve our issues as fast as possible. The support model and team Salesfusion has is definitely a huge asset for them. They are in the middle of updating the platform which leads to some UI inconsistencies and confusion on which version of a feature to use when. They are cleaning things up steadily and the new capabilities are much improved just hope the transition will be completed soon. Also, wish Salesfusion integrated with more 3rd party platforms and services. We can and have worked around this through custom API connections (with their support teams help) but sponsored/managed integrations would be very helpful. We need to capture a holistic view of our customers and prospects. For our marketing automation system to be the true hub of that data we need to be able to collect and interact with all our customer touchpoints effectively. They recently updated their API which I am told will open things up for continued integration. If you are looking for a tool that is on the rise and geared towards ease of use while still providing a lot of marketing horsepower Salesfusion is something you should consider. They may not be as well known as other competitors but their pricing (when we looked) was very favorable compared to other options and the capabilities were at least on par. Our experience with their support team has also been very positive which has been a huge plus for us. We wanted an easy to use scalable platform that we could grow with. Our previous solution was solely email marketing focused and we wanted to move beyond that to encompass the full customer journey which Salesfusion helps us do through its capabilities and CRM integration. Using Salesfusion we have seen increases in leads, better conversion rates due to nurturing programs and effective segmentation as well as reduced manual labor and improved quality as we were able to automate significant portions of our lead entry process using built in lead routing and assignment functions in the tool. I like that salesfusion has a clean design and is very intuitive for users that may not have experience with marketing automation software. The customer service is also AMAZING! I'm more familiar with other advanced software that has stronger reporting capabilities and this is an area that Salesfusion is definitely lacking in. If you're looking for an easy software to send out HTML emails, this is your solution. The reporting for landing pages isn't as intricate as I would like, but the Salesfusion support team is fantastic and will help you build custom reports and pull metrics if you can't find what you're looking for. We use Salesfusion to create events and send out basic HTML emails and integrate with Salesforce. We haven't done any nurture campaigns yet, but are definitely interested in doing those! "Good experience with current platform!" SalesFusion is a rather intuitive platform and user-friendly tools. Their customer service is also very helpful, and they are making constant strides to improve their product. There is room for it to become more customizable, with limitations on the drag and drop tool, as well as the ability to recall campaigns at different steps of the journey and the like. Some of the customer experience can be optimized, but once you find where certain tools live, they are quite helpful. SalesFusion has a lot of benefits that we have to utilize. Currently they are a good tool for e-marketing efforts, and there is also room for it it make up for some of the shortcomings of our "CRM" tool, which is great. "Ideal for Small to Mid Size Businesses"
It is fairly intuitive to use and the pricing is not to prohibitive. Some of the features are a bit clunky and as of late we have been having issues with email sends. Overall though, the platform offers everything you would want. The email setup is simple, creating forms/landing pages is easy and reporting could be improved on their end. I dislike that our emails have been having issues sending as of late, even test emails are having trouble. The support though is for the most part on top of it and helpful but at times can seem like they just escalate things to get them off their plate but nothing gets done. Creating a report could be an easier process and really creating anything new could be easier. It provides a platform that can be connected with many CRMs and allows for customization in that sense. It has allowed our very custom CRM to work pretty well with the email platform. "Great Marketing Automation system for B2b"
Since the product has a lot of functionality it will take us a while to learn, but it is worth the results we are getting. Better tracking on leads from out web site lead generation. We have been able to create, track and improve on our email campaigns and associated landing pages. The reporting is all in one place so our reporting has improved, which makes managements happy.
" IMPROVED MAP AND CRM INTEGRATION & SAVINGS OF OVER $500 PER QUARTER "
The tight, direct integration of Salesfusion with Sugar makes it very easy for us to sync our database, campaigns, and all other relevant information. It's very easy to send and track email campaigns, and setup webinars. We multiple webinars per week, and Salesfusion makes it easy for us to manage internally, and for people to register for our events. The email builder is very easy to use and we can customize our messages without having to code HTML from scratch. The only real compliant I have is that you cannot have multiple windows open simultaneously. So if I'm building a report and need to know the ID of a campaign, I need to close the report, navigate to campaigns, then come back again. We love Jana F. in training! Communication between sales and marketing is key for us. Before, we had so much manual entry of data, it was hard to consistently ensure nothing fell through the cracks. Additionally, our reporting was not accurate as our systems were never in sync. We now have accurate (easy) reporting, and have even been able to retire a few of our systems, saving upwards of $500 per quarter. "Great implementation and support, but sorta e-mail focused"
The onboarding was good and hands-on, and customer support has been very responsive. The application itself has an intuitive layout and fairly easy to use. Great e-mail builder. The landing page builder is outdated and not mobile friendly (new coming in Q2 they say). I'd like if I could set up sales campaigns with landing pages and emails in one dashboard, but I have to go back and forth a lot in the software. Would also like more help on improving email open rate (a lot of mine remains unopened despite being delivered), and using the system in more inbound marketing efforts beyond e-mails. New landing page builder and BI tool may improve that. If you, like us, do not have a large marketing dept, then the hands-on onboarding and support is a big plus for Salesfusion. It is also fairly easy to get going fast, get emails out, users cookied, and get value. Pricing and payment terms are favorable, compared to HubSpot, Pardot and Marketo. Getting more leads from website, reach out to more people with targeted messaging, structure follow-up of leads, establish inbound marketing culture in company. Have gotten to get a few more leads through online ads to landing pages, and catch leads from existing website forms. Also get use of the user stats from website. Biggest challenge to realizing more value is probably on our end - creating content. "usable interface, fairly complete marketing automation, built-in CRM is limited but acceptable." disjointed interface across the platform. Old legacy sections with limited function and archaic interface remain in place alongside new interface and functions; deprecated features remain in place but are not marked as such and can be used unwittingly resulting wasted time getting support to tell you it's deprecated. Salesfusion is a very good all-around marketing automation tool that is very usable. The integrated CRM is good but not great due to it's limitations, but suffices for a company that contracts all sales to outside sales representatives and only needs sales managers to access it. It allows you to effective build up your database, qualify leads into contacts, and track their journey. The "Opportunities" feature in the CRM is the weakest part of the CRM with very little flexibility. These things have inhibited sales manager adoption. If you need robust CRM capability, Salesfusion has multiple integrations with major CRM resources including Salesforce, Dynamics, Sage, SugarCRM and Infor. Other integrations include Google Adwords, event integrations including Webex with excellent API connectivity for connecting to any source using that method. Support is among the best in my experience, but still has some weaknesses, namely reliance upon email which is not sufficient when a complex problem emerges. Acquiring and qualifying leads, delivering to sales, continued marketing to potentials for future or additional business. Making leads and contacts available to sales management through one cloud-accessible database, while delivering lead/contact journey. It has made our contact list much more accessible to sales, and enabled us to find potential opportunities within. Automated follow-up marketing emails have uncovered more opportunities. "SalesFusion offers great flexibility and is easy to use!" SalesFusion is easy to use, I can create and send a message to my audience very quickly and without difficulty, and whenever I have a problem or a question, the response from customer service is always very fast and extremely helpful. It would be helpful to have better reporting options, and it can be difficult sometimes to find old messages when I need to find and refer to them. We reach a large audience of clients with regular communications via SalesFusion, keeping them informed of all the necessary news and information they need to be aware of. "A bit of a learning curve but a very powerful platform"
The features of salesfusion are everything you'd want in a marketing automation platform. We're still learning how to use the system and the documentation is a bit weaker than I would like. Now that we've had a year under our belts of using it I add it is a great platform but has a big learning curve. Look at your overall needs for marketing automation and email campaigns and see if you can find a better value. I couldn't! Mass, yet personalized emails. Easier reporting vs. manual methods, person-level data vs. summary data. "Great product, and an even great company"
Salesfusion is a great company with a product that may not be perfect, but gets significantly better with each upgrade. Whenever we have an issue they are so quick to fix it, and alleviate any issues we had. At times, the lack of integrations can be a bit of a hinderance. But, they own up to this very well and are very willing to hear your suggestions and adjust the platform to meet your needs! "You need to know code to use this product." Support service and training is clear and consistent. Need to use HTML / CSS to create Landing pages. There is no delete function within the nurture campaign - if you make a mistake you need to start over. Lack of information when analyzing an event - i.e. You can't see who has specifically declined an event in comparison to who just hasn't seen the email. When testing an email - the test email doesn't always come through. The HTML of the email temples causes most spam filters to block your emails (unless you know how to hard code you can't fix this). Campaigns are now all localized. Native integration with our CRM (SLX, Infor), top-notch customer support(they almost always find a satisfying resolution for us), actually implement ideas you suggest as product updates, tons of reporting features. Anything besides out of the box reporting features may require assistance from support. Great company for a medium to small sized companies, and likely scales well for large size companies. We are a medium sized business and Salesfusion goes above and beyond our requirements for Marketing Automation. "Very Intuitive. Affordable. Easily Integrated. And a Managed Services Option That Changes the Game!" Salesfusion is designed by marketers who, no doubt, have experienced the perils that many of us face with Marketing Automation. They have built a platform that is intuitive, affordable and easily integrated. The result? You are able to ramp up quickly. The native integration with most major CRMs alone is fantastic. Salesfusion truly delivers "enterprise grade" capabilities without the "complexity" of other marketing automation solutions. Their secret sauce? Their marketing concierge services - which literally "saves the day" for me. This enables me to consistently move the needle in my quest to deliver demand generation results. Did I mention unlimited phone and email support? I guess you can say - I'm a Salesfusion super-fan. I'm sure there's something. I just haven't encountered it yet! They have a good handle on their roadmap and keep me informed about upcoming feature / capabilities improvements. That's all I ask for. Give Salesfusion a try. You'll be glad you did. I deliver against an "aggressive" marketing plan - ongoing weekly campaigns. A primary responsibility of mine is to deliver qualified MQLS that ultimately convert into Sales opportunities. We are now able to keep the funnel full (MQLS) and are adding advanced capabilities into our marketing practice to increase conversions. Senior management is more than satisfied that we are doing our jobs. I thought the implementation was smooth. Their implementation team seemed to be knowledgeable and provided the proper support. Setting up the product on our end was flawless. It works with on-premise CRM as well as cloud base. I am not a huge fan of their support team. We've had repeated issues with syncing between our on-premise CRM and the Salesfusion cloud. Our system is configured properly and up-to-date on the latest patches. However, their team continues to state that our server is causing the failures. Just be aware that their support can be a hit or miss. I recommend taking a look at other vendors as well before going with Salesfusion. We've always had challenges with users sending mass emails from their local Outlook email software. This is no longer the case since the user can now upload their lists to Salesfusions and have them be sent on their behalf. It's reduced the probability of our domain being blacklisted unnecessarily. "Great platform that is always improving"
Salesfusion listen to their customers needs and are always making improvements. I also like their native integration with NetSuite and oktopost social platform for a full business solution for building relationships and marketing your business. Tools I like most are the form builder and email maker. I haven’t really gotten into the guts of it yet I feel by using the scoring tool which has huge power when getting into prioritising and measuring customer behaviours. The load speed can be slow at times. The events section needs updating but they are always updating things, I’m sure that won’t be too far away from being worked on. The neuture tool is good but is designed for email marketing and list marketing and not for use on econmerce ‘if this then that’ statements. I can now send reliable and great looking emails and measure them well. I can make landing pages when needed for contests and add salesfusion powerful forms on our website. I can also see a customers full history on clicks on the emails and website as well as an integrated powerful social media platform for our technology wholesale business. "Fairly easy to use, but with limitations"
Ability to use old campaigns as a starting point for new ones. Can be created quickly. You can't resend a campaign to additional people. You have to recreate it and send. Sometimes the code is wonky. Takes some time to figure out why things don't work like you think they would! Would be easy for someone who know code. New learners can create basic, but have limitations. Marketing campaign design and uniformity to newsletters. Great statistics and nice to have unsubscribed, and failed email addresses so we can update them in CRM. "Great people that take care of you"
The customer service is remarkable. Any email or phone call on my end elicits an immediate response from Salesfusion. Although we have particular reps accountable for our success, I can call up anyone at Salesfusion and be taken care of. They work seamlessly as a team through the course of solving my problems. I also love how they write a ticket for every little thing, even if it gets resolved on the call. They are definitely thinking from the customer perspective, thinking and working together alongside us, and it makes a big difference. The company is clearly growing fast, and making constant updates to their user interface. As a result, some functionality gets lost in translation. It is sometimes hard to navigate through their modules, or know where to go to find things. Creating reports for my leaders can be tough. Given the complexity of emarketing and the needs of clients in a fast-changing tech world, Salesfusion is still the best option we've seen to satisfy our complex needs. As a customer, they are very open to my suggestions to improve their site, and like I said, they are constantly making things better. We were able to solve many issues we couldn't before for a number of our complex email campaigns. One campaign requires thousands of emails sent from hundreds of different users at once, and the ability to create many customized fields, including hard-coded fields. A process that used to take us months took us days. Another is our first real nurture campaign, which we could never before execute with such complexity and care. "It's been a great year with Salesfusion"
The onboarding process with Salesfusion was outstanding with recorded training sessions that I've been glad to look back on throughout the year. There are many features we've not yet tested but the core product is very sound and it's super useful to have so much information pushing all the way through to our CRM. I'd like to see Salesfusion improve on the ease of creating custom reporting. That said, I've been very successful with support for building out the custom reports I've needed. Be prepared to have your campaigns lined out to take advantage of the automated drip marketing features. The system will do it, but it takes time to plan that far in advance! Visibility of contact activity on our web site has been very useful. Push through to CRM a huge benefit. The difference between this and our old one-way email platform is tremendous. "good so far, only been using since march"
I just learned about the lead scoring tool and this helps our recruiters know who best to reach out to. Making analytics more straight forward. We are reaching a lot of our clients and candidates regularly with tracking benefits. Our clients and candidates have been staying in formed regularly now. Customer service is outstanding! Anytime I have a question or a request, I get a very timely response. Communicating with them could not be easier. We are at the very beginning of our implementation and I have to say the email builder is incredibly intuitive and looks great. There's a bit of a learning curve when creating landing pages and forms. It's not quite as user friendly if you don't have much experience in HTML. That being said, I'm under the impression that this is something that will be overhauled soon. We currently are sending monthly newsletters to individuals in a very manual process without much segmentation. Salesfusion is giving us the ability to send segmented emails, alert sales of lead activity and gather and track the lead process through our site. "Overall an average provider if you don't use Salesforce as a CRM"
I like the new drag and drop email builder. It's more up-to-date with what you'd expect from a marketing technology provider. I also like the add-in to MS Dynamics CRM and how it allows you to see the customer journey, add or remove them to lists and nutures and email a contact straight from the CRM. An added benefit if you don't want your sales team to have full access to your Salesfusion portal. Reporting is limited to say the least. There's no easy way to track link clicks or downloads, unless they are gated by a form. Also, most reports require tables or multiple tables to be pulled in- almost always requires help from their professional services team at an extra fee. Ask a ton of questions and talk to customers. Do you report a lot? Look at that feature closely. If you are also using it as a CRM- keep in mind the limitations and benefits there. Marketing automation is a must- but it's only beneficial if the provider chosen syncs with your CRM. Salesfusion is one of the better alternatives if you aren't using the popular Salesforce as your CRM, however, if you are used to one of the "top players" in the automation game- there are several frustrations you'll gain from Salesfusion. The benefit of the software entirely depends on your companies needs- landing pages, email, CRM connections, reporting,etc. We use Salesfusion to solve the problem of getting data into the CRM, that works-most of the time. The biggest benefit we've gained is that now our sales team can see what customers and prospects are doing to interact with our data also. "An easy to use tool"
The drag and drop builder for landing pages is easy to use, and the templates available give you a lot of stylish options. Sometimes reporting can be a little bit difficult, but support is very responsive. We use it mostly as an email marketing tool. It's been a great way to reach our customers en masse. We are now exploring using more landing pages and forms for events and products. "Over satisfied with product, although I see areas where product can be improved"
Salesfusion has a learning curve but once you learn it, it is an incredible tool. It offers a lot of power to marketers like myself who really like to be in control, but also the ability to be hands-off in the places that I want to. The best feature of Salesfusion, is how easy it is to use. Sometimes there are delays in setting up distribution lists. "Great product, looking forward to the improvements!" So far my experience with SalesFusion has been positive! The interface is very easy to navigate, they have a ton of support available to get really good at the tool, and there are a lot of metrics to measure the success of your campaigns! Working with the sales rep and onboarding staff has been very enjoyable. There are bugs, especially surrounding the WYSIWYG tool, but our rep has told us they know about the issues and are working to get it to be better. It's functional and does what it needs to do, but it could be a lot more responsive and robust. We are trying to get some campaigns off the ground and are really starting at ground zero with our marketing automation. I'm looking forward to seeing what we can really get out of this! We mostly utilize it for mass emails, and follow up after. We utilize the analytics to see who has opened and clicked links to see who is a hot lead so we can call them. "A product is only as good as the people behind it"
As a professional in the recruiting industry, I put a high value on talent. Our company selected Salesfusion over other marketing automation platforms because we were looking to build a strong relationship with a local vendor. Over the years, Salesfusion has done a great job of becoming what I consider an extension of our marketing department. From onboarding, to my monthly touch point calls with my client success manager, I have always felt that the team at Salesfusion is flexible and genuinely wants to help us succeed with our business goals. This is more of a wish than a dislike, but I hope that they develop a user certification program or a university track for more advanced users. I recommend cleaning your data and having a discussion internally about business goals and priorities. It's really easy to get off track using a blank slate software that can be customized for your business needs. Salesfusion is an incredibly expansive tool to implement and utilize. There are various areas of our business where Salesfusion has assisted us, including our email campaigns and contributing to the alignment of our sales and marketing teams. "Excellent Customer Support and New Features with End User in Mind"
SalesFusion is easy to use, provides all the tools to successfully market and drive new business. The Customer Support team is always friendly and helpful and respond in a timely manner. They also provide lots of access to self paced or online training. We a very satisfied customer and continue to be pleased with the product and service we receive. Be sure to attend their training sessions to pick up the best practice tips and tricks. Greater visibility of the success of our email marketing campaigns and web tracking. "Sales and Marketing in Sync with Salesfusion"
Best features: lead scoring, nurture automation, event management, CRM integration and reporting. The event management feature is worth the subscription price. It's basically "mission control" for a webinar or live event. Fantastic! Needs improvement: ease of creating landing pages, emails, etc. We've struggled with our external lead forms--both the creation and website deployment. I've also encountered some quirks, which the SF team is addressing. Build a plan/process before implementing a tool. The process you build will help identify the right tool to automate your marketing campaigns. It will also help you identify your approach once onboarding is complete. The Salesfusion team is highly-approachable. They are very knowledgeable and are a great resource. I can depend on their prompt responses to my questions. Business problems: marketing and sales alignment, automation of lead capture/scoring, consistent campaign communication and providing a 360 degree view of the prospect. Benefits realized: increased efficiency (less time spent manually adding information); seamless tracking and displaying of prospect interactions within the CRM; and increased ability to deliver excellent content to prospects/clients. Although it may be considered a "soft" benefit, our sales and marketing team is working together to maximize our results from Salesfusion. We discuss and define sales qualified leads, and collaborate on scoring thresholds. We work together to plan our campaigns and events; as well as the follow-up strategy. Increased collaboration and better sales and marketing alignment. "Robust System, Lots of Features"
Well suited for businesses that rely heavily on email marketing or who are likely to have users visit their website on multiple occasions. Great integration with CRMs for sales team engagement and data sharing. - Additional user education available through downloads for existing customers rather than scheduled webinars would be helpful. - User interface was somewhat cumbersome, but they've recently updated and it's much better now. Robust system with lots of great features. Their reps and support staff will help you through the initial learning curve. You'll be glad you invested the time in learning the features of the system. We currently use Salesfusion as one part of overall marketing strategy for our clients. Some use the service to communicate with existing clients, others use the system as a platform to attract new customers based on website interaction. "Best tool from sales view." With SalesFusion I like most the approach from result side. This is serious solution for companies who want to achieve real results, instead just having some marketing automation system. Full control on detailed process flows, predictive lead scoring, possibility to automate practically everything and being able to manage and produce all needed contents and process flows. Personallly I don't like solutions that are just easy to use and not able to produce wanted outcome. Overall very comprehensive package including possibility to integrate practically with any CRM. Customer service is outstanding and I have received answer and solution to any issues I've encountered this far. Learning curve is of course much steeper than with some widely used entry level solutions, only thing that I somehow dislike, is that orange color is used everywhere instead changing colors slightly within different categories. then it would be better to choose some simpler solution. Being able to produce 150 times more qualified leads than before, rise of sales hit rates with 50% by better quality leads. "Fanatical support and customer focus"
Salesfusion has a very solid marketing automation platform, but what truly sets them apart is their focus on their customers' success. They have shown from the first contact through our entire relationship with them that they deeply care about their customers and want to make sure that we are successful with the platform. The onboarding process is quite comprehensive as well. We've been a salesforce customer for 10 years, so the integration with Salesforce was a critical aspect of our decision making criteria. They do releases on a fairly regular basis, and have a customer idea wall where they collect comments, ideas and more from their customers to help improve the product. Their training area, in addition to SalesFusion University (on-site training) are excellent. There are a couple of features that are lacking, but there is a new version of some of these coming out soon so hopefully this will get remedied. We needed to replace a vendor who was underperforming, implement new marketing automation processes, and most of all, start lead scoring and running nurture campaigns. Our previous vendor was very hard to work with and unresponsive when we needed help, and the tool was archaic and inflexible. With Salesfusion, we are able to run comprehensive nurture campaigns for both customers and prospects, get great insights and analytics about our prospects' behavior, and generally run as a much more efficient marketing organization. We're a lean team, so getting the right tools in place was one of my first priorities. In addition, they have an excellent email plugin that allows 1-to-1 emails from sales rep to prospect to be tracked and recorded in Salesforce. All in all, I highly recommend Salesfusion. "Salesfusion SaaS-based Marketing Automation Software for Business"
- Excellent integration with the Infor (Saleslogix) CRM. - Provides great features such as the ability to segment groups of people to deliver more personalized messages. - Great reporting tools to measure the success of a marketing campaign and quickly evaluate what is working and what can be improved. - Superb customer support that responds to questions quickly and thoroughly. - Identifying and removing unneeded contacts (duplicates etc.) can be challenging, though some recently added features should help with this. - The WYSIWYG and HTML editor can be challenging to use for some content creators. Salesfusion is a very full-featured SaaS-based email marketing automation software for business. They're a great company that provides excellent customer support. I recommend Salesfuison to any company who is ready to benefit from marketing automation. A huge benefit is the ability to measure the effectiveness of various marketing campaigns. Integration with CRM and the reporting tools are also major benefits. The all in one interface to manage contacts and leads from Microsoft Dynamics. The upload tool requires a lot of manual entry to map the fields of the spreadsheet. Also, the report generation tool is awful. It's not intuitive at all and it would be of great use to my team. Decide if you're going to need to reporting tool and custom mappings to your CRM. Custom mappings have created a headache..
Management of all email blasts, campaigns, etc. Mass uploads to crm. "Salesfusion is a difficult platform to learn and since its a newer tool, it's missing functions"
The ease of building an email template helps to quickly put together templates for approval as well as timely email communications that need to go out. The lack of features offered as well as the fact that you can't copy and resend an email campaign to a new list withouth creating an entire new campaign and pulling in the template is very frustrating. The marketing dashboards and ease of use. The ability to see all of our campaigns and drill down and compare them to see which ones were successful and which ones weren't. The tool works well for lead generation for sales for a company. We use it for multi marketing strategies with additional tracking and it can sometimes get challenging to have multiple users involved with leads / campaigns. Take advantage of all of the training and early set up instructions. Become very familiar with the training and user guide available on line. Think about investing to attending the Salefusion Universities. They are indepth and provide individualized training that is specific to your needs and use. Management and tracking of our marketing campaigns. We have realized tracking we have never had before. Salesfusion is always updating their product to enhance the user experience. It seems each update has a new feature or simpler set up that allows me to maximize the experience and increase my productivity. The features have become so easy to use, when I train others, they understand the functions in one meeting, rather than two or three meetings. Plus, Salesfusion keeps a great online library of resources and guides. Also, the customer service is top notch. My phone queries are nearly always answered and answered by a professional who can guide me to a solution, or provide within a couple of hours. If the first solution does not work, the team continues to work until I receive teh desired outcome. Sometimes on Google Chrome, the functionality ceases. Double-clicking items no longer loads until I reset my cache in the browser. Sometimes the terminology used for some of the features is a bit too technical and as a layman, I need help translating to meet my needs. However, this has become less of an issue as Salesfusion continues to rename some of its features and provide detailed descriptions in the update newsletters. The reporting is still tricky and required some database knowledge to be sure I include the correct fields to meet my needs. If the primary user or administrator does not have a technical or database background, it may be worth checking out some of the Salesfusion training and guidance materials in their library. I send emails to both our internal and external sales agents. We also host langing pages for events. We are in need of trackability of our email opens, clicks, and event activity. The tool has worked as a short-term solution for posting some of our required materials. We can be sure that the required materials will be delivered directly to the recipient through email communication. "Salesfusion is the only tool you need"
Salesfusion allows you to do everything you need to reach your target audience and track your campaigns. The platform is user friendly; even the technologically-challenged marketer can create comprehensive, effective campaigns. In addition, the Salesfusion team provides support, if needed, and is continually upgrading the platform's functionality based on feedback from the users. Definitely the way to go if you're looking for an email platform. Nothing. My experience with Salesfusion has always been positive. The Salesfusion team is awesome. They are easy to work with and always willing to assist you in any way necessary. The platform provides detailed reports which allow our Marketing Department to study the statistics and trends for our campaigns and fine-tune our strategy in response to the findings. In addition, Salesfusion is willing to work with its customers to solve problems and ways to improve their platform or add functionality in response to customer needs and industry best practices. "Attending the Fusion conference was a very worthwhile experience"
The best part of the Fusion conference was meeting that people that work there. They all are highly motivated people and it was a pleasure to meet them in person. As a reseller for Salesfusion, we came away with many awesome ideas for sales, marketing. It's hard to think of something we dislike, but perhaps the reason we haven't started our lead scoring process yet is that it was difficult to set up the rules for it and get a good understanding of how to track the scores and see them convert. We could use help in this area if anyone at SalesFusion has time to work with us on this! I would fully recommend the 30 day risk-free trail. During the process, we had a chance to use the platform, fully integrated with our CRM, to run test campaigns from. We used it for a few email sends and tracked the results without ever being committed. This was a game changer in deciding which automation platform to choose. We are trying very hard to align the marketing and sales departments in our company. We've received a lot of ideas at the Fused conference and would like to start implementing some of the features we've seen such Social Listening and the Nurture Campaign Editor. I think using some of these new tools and diving deeper into the SF platform will help us to reach our goals of highly valuable MQLs that our sales team will be happy to receive. It's hard to think of something we dislike. Some areas of Salesfusion are so robust that it is difficult to set up, but I talked to our reseller trainer and he is taking the time to assist me with some one-on-one training. Thank you Andy!! Just do it! This is the best marketing automation software out there! As a Sage CRM consultant I can't wait to start helping our customers with a fully integrated marketing system. It makes me happy that I can assist our customers with the best marketing automation software that I have ever come across. Sales and marketing teams will finally be able to work together to pull in qualified leads. It has all of the bells and whistles you want. The ability to view campaign-specific dashboards is also great. My campaign timezone is always wrong, so I always have to convert local time to Azores GMT... Even though my account is setup with my local timezone. Learn HTML/CSS so you can have greater flexibility in your email designs. Fully-tracked communications are able to be distributed. It's allowed us to identify those who are engaging with our content. I highly recommend Salesfusion! We have been using it for under a year but already it has changed the way we work and we have only scratched the surface! We are finally automated! We are able to view the email statistics and determine if the email subject line should have been changed. We are now able to view web activity, create surveys, nurtures and so much more! The customer support and client advocacy is unmatched in the marketing automation industry. They go out of their way to hear new ideas and continue to thrive and make the system better constantly. The features can be very buggy. I have many issues with the email builder on a day-to-day basis. I have issues with the reports (custom reports are a nightmare), the biggest pain point for me is the lack of consistency in the features working as they should and then those issues are not able to be replicated with IT support. If you're a company that will use the system for 1-3 emails a week and for sales and marketing alignment it could work perfectly for your business. The A/B testing functionality is helping to make testing smoother and easier. "CASL Compliant Newsletter Tool that goes further with Analytics and Design Functionality in mind"
Look for product that is CASL Compliant? Look no further. SalesFusion 360 has it! It also sends the information back to your CRM with a seamless automation that took me a few minutes to setup. The analytics are out of the world. For example: You can find out who is searching what on you website, you can know when someone has opened a link to a particular newsletter within a dashboard. Looking for a new newsletter template for a campaign? Well, Salesfusion has made it very easy for you to select from over 500+ templates to select from - Looking for a Responsive design? Yes - they got it too. Can't go wrong, hence we are very satisfied with this product. As with any type of new software, you will need to learn the in's and out's of the product. Though I was able to self-learn the product, I do recommend that you complete the goto classes that are provided. CASL Compliant with Subscribe/Unsubscribe Functionality (tracking) and Newsletter Responsive Design. "B2B Technologies Looking to Align Sales & Marketing"
The best part of SalesFusion are the people we work with through support and product questions. We receive answers immediately and the person helping us is interested in getting us to the end goal of the project and not just answering a one of question. Follow through is key and SF has mastered it. The customer service and responsiveness to questions is top notch! There is nothing about the product that I dislike. Salesfusion has unlocked the limitless potential of digital marketing and CRM tools. "Efficient, effective, and intuitive marketing automation tool." I like the layout of the software. There is a large working space for customizing your HTML and the buttons to navigate elsewhere in the application are neatly hidden to the left side of the application. Great access to the learning management system within the application allows for quick and easy troubleshooting when an issue arises. Email delivery is fantastic, great Social plugins, and a complete lead scoring model makes Salesfusion one of the best and most capable marketing automation systems I've had the pleasure of using. It can be a bit clunky and repetitive when navigating from one area of the software to another. I have consistently seen shortcuts and "quick steps" developed in the application to cut down on some of the congested areas. That's why I like this application. It's always evolving and becoming easier to use! Overall marketing communication have been streamlined and more efficient. I had an 87% better email delivery rate compared to my previous email service provider. Cranking out campaigns and messaging has never been easier! I'm working 2 weeks in advance now and it makes my life easier. "Great so far but excited to maximize the tool even more!!! :)"
I like the ease with which you can create an email without being an HTML expert or knowing a lot about graphic design. My background is in writing yet I can still create a visually appealing email using the email editor (although after trying the new one this morning, I'm excited for it to become even ore user-friendly!) I also love the reporting feature; I love how you can totally geek out on the numbers. I'm only beginning to explore the custom reports but I love what I see so far! I dislike having to repeat a text style - font size, color or style - because the editor doesn't always keep the change you just made. I often make a change, save the email, send myself a test email, and the change does not render and I have to repeat myself. I would highly recommend this product to others - I can't wait to do more with it! I am able to target more specific audiences with the tool, and measure how those efforts are working using the great reporting features. "Powerful marketing automation solution with successful implementation"
The best thing about SalesFusion is the ability to tailor nurture campaigns based on specific actions or knowledge that you already have about the user. It allows us the ability to speak directly to what the user may want so they aren't flooded with messaging they don't care about. Some of the interface is clunky and HTML designing is the easiest for our look and feel - something that I'm not well-versed in at all. Other than that, I don't have the content to fully utilize the tool, but that's an internal issue! Definitely shop around, you'll find that Salesfusion offers the best bang for the buck. It's also a growing tool. Even in the short time I've been using it (less than 1 year), I've seen some great changes and there are more changes to come! We are trying to better qualify our sales leads as well as create some better interest generation. We've been able to have more access into the seeing what users are doing on our site, see what they are engaging with, and see more of the product interaction. * We monitor all Salesfusion reviews to prevent fraudulent reviews and keep review quality high. We do not post reviews by company employees or direct competitors. Validated reviews require the user to submit a screenshot of the product containing their user ID, in order to verify a user is an actual user of the product. Hi there! Are you looking to implement a solution like Salesfusion?